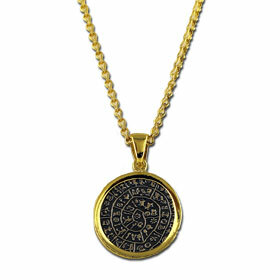 A detailed Phaistos Disc Sterling Silver pendant on a gold plated sterling silver mount. The gold mount around the disk, highlights the disk detail and antique look. Wear this with matching earrings! Included Popcorn chain measures 18" (45cm) and it is removable. The actual Phaistos Disc (Greek Δίσκος της Φαιστού, also spelled Phaistos Disk, Phaestos Disc) is a disk of fired clay from the Minoan palace of Phaistos, possibly dating to the middle or late Minoan Bronze Age (2nd millennium BC). It was originally discovered by Italian archaeologist Luigi Pernier, remarkably intact, on July 3, 1908 during his excavation of the first Minoan palace. Click HERE to view a sample of the original disc. When discovered, the disc was found in the underground basement "temple depository" - known now as "room 8 in building 101" of a group of buildings to the northeast of the main palace. These basement cells, only accessible from above, were neatly covered with a layer of fine plaster, and amongst black earth and ashes, mixed with burnt bovine bones. This grouping of 4 rooms also served as a formal entry into the palace complex. Italian archaeologist Luigi Pernier recovered this remarkably intact "dish", about 15 cm in diameter and uniformly slightly more than one centimeter in thickness, on July 3, 1908 during his excavation of the first Minoan palace. The original disc is about 15 cm in diameter (slightly more than one centimeter in thickness) and covered on both sides with a spiral of stamped symbols. Its purpose and meaning, and even its original geographical place of manufacture, remain disputed, making it one of the most famous mysteries of archaeology. This unique object is now on display at the archaeological museum of Heraklion in Crete, Greece. There are 241 tokens on the disc, comprising 45 symbols (for example, "Man, Woman, Child, Bow, Arrow, Shield, Ship, Dove, etc. ), mostly representing easily identifiable every-day things. In addition to these, there is a small diagonal line that occurs underneath the final sign in a group a total of 18 times. The disc shows traces of corrections made by the scribe in several places. Some scholars have pointed to similar resemblances with the Anatolian hieroglyphs, or with Egyptian hieroglyphs.